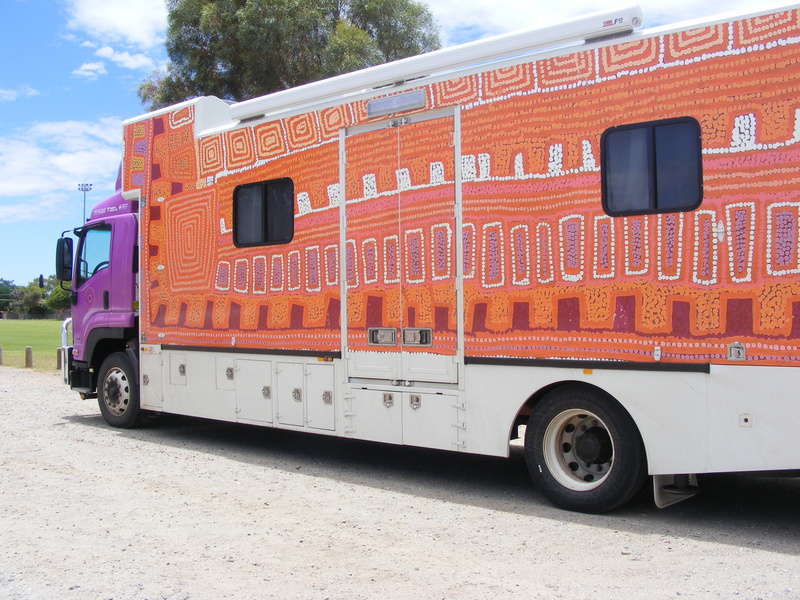 Ningura Napurula's artwork, 'Rockhole Site of Wirrulnga' 2005, acrylic on linen, 183 x 153 cms on the new mobile Dialysis Truck. TO WHOM IT MAY CONCERN – WITH MONEY! I am writing to excite you with talk about the significance of the art works and colour of the truck. It is 11 years since Pintupi people painted pictures and raised one million dollars at the Art Gallery of NSW. Their aim was to improve the lives of their family members forced to leave their country and receive dialysis in Alice Springs. They set up the Western Desert Nganampa Walytja Palyantjaku Tjutaku Aboriginal Corporation (WDNWPT) and changed the face of kidney disease in Kintore as we were able to get people home to live on country and with family. Early on in the development of WDNWPT, we established the Purple House in Alice Springs. Originally an institutional grey brick, the patients chose the colour as a symbol of hope, of homeliness and optimism. It made the house welcoming for people who were reticent to enter the building as they knew it contained dialysis machines. The colour purple quickly turned into a brand…signifying a creative, community driven health service breaking new ground in developing culturally appropriate health services by and for the mob! 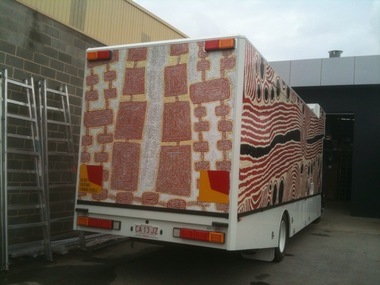 The new truck will be a real symbol of the efforts of the Pintupi over the past decade. With a purple cab, it will be immediately linked with our Purple House bases in Kintore and Alice. Patrick Tjunngarryi is an award winning artist, a senior Pintupi man from the most remote community in Australia, Kiwirrkurra WA. His paintings feature prominently in the Canning Stock route exhibition which is about to open at the Australian Museum in Sydney. He himself is a diabetic who receives peritoneal dialysis with our support. Ningurra Napurula’s paintings appear on the ceiling of the Musee du quai Branly in Paris. She is a senior Pintupi woman and is on dialysis 3 times a week in Kintore. Maurice Gibson is her son and also is receiving dialysis care there. Despite bilateral amputations, he has a joy of life which is remarkable and shows in his paintings. All three paint vibrant representations of the country, its sacred sites and water holes. They are stories of travelling through country. All are significant Papunya Tula artists whose works are in demand internationally. Such a project has never been undertaken before. The paintings will potentially come to the attention of an international audience; but at the same time are layered with symbolism which is instantly understood by all from the Western Desert. Our truck will be a show stopper! It will attract people on communities to come and see it. As a non-threatening symbol of family connectedness and ownership rather than white fella technology, we envisage many conversations about reducing the risk of kidney damage and failure, often conducted by dialysis patients themselves as they proudly return home. There are a few other examples of projects that spring to mind when thinking about the symbolism of this truck. The QANTAS plane painted with a design by Rene Kulitja from Mutitjulu is an obvious example of the power of art to draw attention to an ‘ordinary’ object. Rene is a member of WDNWPT and, sadly, her husband who was on dialysis recently passed away. His brother Mark is currently receiving dialysis at the Purple House in preparation for returning home to Mutitjulu in our truck. For WDNWPT it is vital that our health services are presented and delivered in a culturally safe way - hence the involvement of community members in the design, implementation and running of this project. 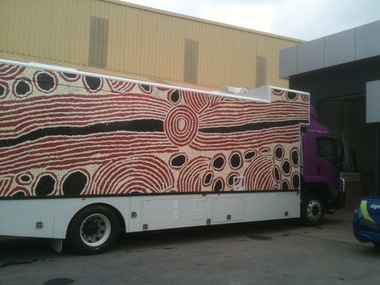 They believe that it is of critical importance that the truck be visually linked to the history of WDNWPT, the stories of Ngurra (Country), Tjukurrpa (Dreaming) and Walytja (Family). And it will always be the Aboriginal board members who will decide where the truck will go. For instance, it might spend a month at a community like Docker River in conjunction with a festival or Sorry Business so that community members who have to live in Alice Springs for dialysis can at least get back to family and country for a reasonable period of time. The only communities with a permanent facility are Kintore, Yuendumu and Hermannsburg. $340,000 of the funding for this project has come from the pharmaceutical industry in the form of Medicines Australia, who deserve high praise for having done a bloody good thing and having created an enormous, gorgeous, permanent canvas to advertise their generosity and courage! Jimmy Little, who introduced us to Medicines Australia, has made sure we have a good sound system on board! And Fresenius Medical Care has donated the vital machine and water treatment system. And the whole project has been recognised already by a National Primary Healthcare Award (see last Monday's ABC Radio National Health Report) and is in line for a Human Rights Award in Sydney next week. We are planning a truck facebook page so that people can become ‘friends’ of the truck and follow it’s progress.